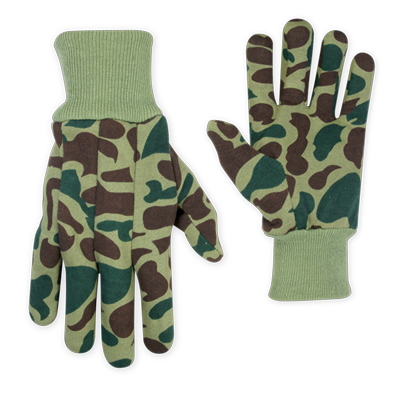 Standard weight cotton/polyester jersey glove in a camouflage print with khaki colored knit wrist cuff. Camo print hand and palm. Clute cut with knit wrist. Please note that gloves are designed for specific applications and that when working with materials that are highly abrasive or corrosive even high quality gloves will experience accelerated wear. Please ask CLC for a recommendation if you have any question about the application of a glove for a specific use. CLC gloves are not fire resistant. DO NOT expose to open flame or areas of intense heat. Warranty claims should be submitted through the CLC website. Products suffering from defects in material or workmanship should be returned to CLC, freight prepaid by the sender. A Return Authorization is required. To submit a claim please select "Contact" from the main menu on the CLC website. When the Contact window appears select "Return Authorization" from the dropdown box, fill in your contact information, and in the "Comments" box please enter the style number or UPC number of your item and describe the related defect. Customer Service will respond via e-mail with your Return Authorization number. When your return is received, CLC will either repair or replace the item in question, at their discretion.